As promised to my lovely facebook friends (and perhaps my blog readers would like this too). A few healthy recipe's will be posted here from time to time. 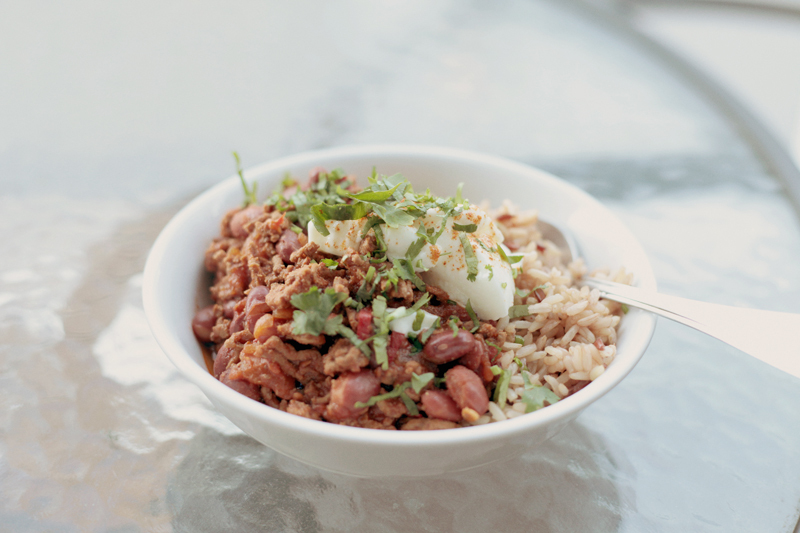 Here's my husband's favourite healthy version of the chilli con carne adapted from the amazing Sally Bee. Once you make this, you'll never find the need to buy ready-made Mexican spices. Don't be afraid of the big ingredients list, it's really quite simple to make and all of those items can be purchased from your local supermarket. Since living in Sydney both Wayne and I have lost around 5kg's because we're walking around everywhere and I'm exercising everyday. Back in Melbourne we'd spend at least 2 hours on the train to and from work, and now we are a 5 min walk to work. All that extra time is spent at the gym or cooking healthy meals. So good! 1. In a large, lidded saucepan, dry-fry the minced beef until brown over high heat. Drain off any fat. Turn down the heat to medium-low and add a little olive oil and then add the onion and garlic and cook gently until softened. 2. Add the chillies and all the spices and continue frying, stirring occasionally for a few minutes. 3. Add the canned tomatoes, tomato paste and stock. Stir well and bring to the boil. Reduce heat and simmer gently for 15 minutes or until liquid is reduced. 4. Season with pepper and add the drained kidney beans. Cover and heat through for another 30 minutes, adding a little stock if needed. 5. Serve with sprinkled coriander and a dollop of yoghurt with some brown rice or salad of your choice. If you're having rice, keep it to just 1/4 of a cup of cooked rice per bowl if you are intending to lose weight. Otherwise 1/2 cup if you're maintaining your weight. can't wait to try this Farrah - thanks for sharing! Looks amazing! x hivenn p.s enter my $200 shopbop giveaway?